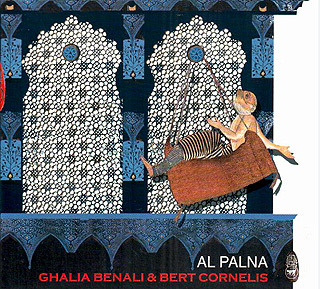 Al Palna -The Cradle- is a musical encounter between Tunesian singer Ghalia Benali and Belgian sitarplayer Bert Cornelis. Ghalias magical voice mixes wonderfully with Berts subtle sitar playing into a new sufi-like sound. Belgian classical radio KlaRa (Paul Rans) produced the album. The cooperation between Ghalia Benali and Bert Cornelis resulted in the project Al Palna, in which these two -seemingly different- cultures meet and blend quite naturally. With the aid of Anwar Aboudragh from Iraq (vocals, jozza), Prabhu Edouard from India (tabla) and Azzedine Jazouli from Morocco (Arab percussion) they made this recording under the guidance of Paul Rans from KlaRa radio. The result is a very extraordinary cd, that might even be the start of a whole new genre. Berts western roots with strong Indian influences and the liberal way in which Ghalia uses her Arabic music create a magnific new sound, music that comes straight from the heart. The natural sounding mix of classical Indian traditions and Arabic music creates an unusually intense, almost trancelike musical experience.